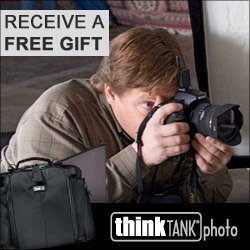 Just in time for Spring, Think Tank Photo announces a special offer on their popular StreetWalker™ backpacks. When you buy one of Think Tank’s spacious and comfortable StreetWalker® Pro or StreetWalker® HardDrive backpacks by April 30, 2012, you will receive a padded Pro Speed Belt™ ($39.75) for free! StreetWalker Pro ($169.75) – Holds most 400 f2.8 lenses with a pro size DSLR camera body attached or a pro size DSLR and 70-200 2.8 attached. Lens hood can also remain attached in shooting position. 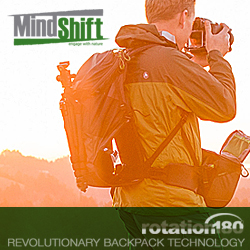 Bottom front pocket can be used to carry a tripod or monopod. A pop out tripod cup is built in for carrying a larger tripod. Removable seam-sealed rain cover included. StreetWalker Harddrive ($189.75) - Holds most 15” laptops. Carry a pro size DSLR and 70-200 2.8 attached with hood in position or a Nikon 400 f2.8 attached to a pro size DSLR body. Bottom front pocket can be used to carry a tripod or monopod. A pop out tripod cup is built in for carrying a larger tripod. Removable seam-sealed rain cover included.